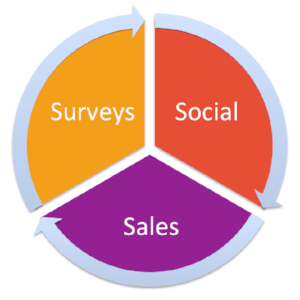 Intercept Microsurveys: Reach the right respondents at the right time! Intercept Microsurveys, in addition to being very short, are prompted by a particular action of a visitor to a website in real-time. Insight generation which relies on consumer memory is often not accurate, so the best way to ensure you are receiving accurate information and feedback from your customers, is to know when to ask. It is also important that you keep your surveys 'micro' - or in simple terms as short as possible, to avoid boring the visitor and keep them engaged until the end of the survey. Intercept Microsurveys make it possible to reach the right respondent at the right time and maximise completion rates! An intercept is a prompt that is presented to some (or all) visitors of a website, triggered by specific actions of the visitor, usually to ask for information or invite the visitor to participate in something - in this case a brief online survey. How can intercepts be triggered? Intercepts can be triggered in numerous ways, some more advanced than others. Intercept triggers include actions performed by the visitor - such as accessing a particular page or clicking on a particular button or section, visitor behaviour - e.g. on the nth visit to the same page, and cookie or custom user data - e.g. the number of items added to the customer's basket. What do intercepts look like? Intercepts can appear in front of the visitor in various ways, for example, in the form of a banner across either the top or the bottom of the page, or as a pop-up. The initial message prompts the visitor to participate in the short survey, and only if the visitor agrees the survey will appear, usually as a smaller window on top of the current page, or in a new window. How many questions should I be asking?